America is in crisis, from the university to the workplace. Toxic ideas first spread by higher education have undermined humanistic values, fueled intolerance, and widened divisions in our culture. Shakespeare and Milton? Oppressive. American history? Tyranny. Professors correcting grammar, or employers hiring by merit? Racist, sexist, classist. Students emerge into the world believing that humans are defined by their skin color, gender, and sexual preference, and that oppression based on these characteristics is the American experience. 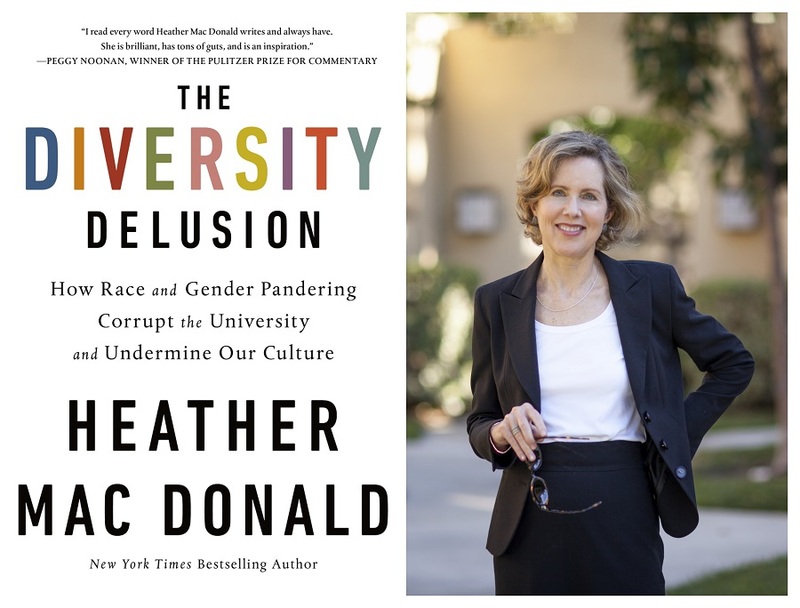 In THE DIVERSITY DELUSION: How Race and Gender Pandering Corrupt the University and Undermine Our Culture (St. Martin’s Press), Heather Mac Donald argues that the root of this problem is the belief in America’s endemic racism and sexism. University diversity commissars denounce meritocratic standards as discriminatory, enforce hiring quotas, and teach students and adults alike to think of themselves as perpetual victims. From #MeToo mania that blurs flirtations with criminal acts, to implicit bias and diversity compliance training that sees racism in every interaction, THE DIVERSITY DELUSION argues that we are creating a nation of narrowed minds and putting our competitive edge at risk. But there is hope, too, in the works of authors, composers, and artists who have long inspired the best in us. Compiling the author’s decades of research and writing on the subject, THE DIVERSITY DELUSION calls for a return to the classical liberal pursuits of open-minded inquiry and expression, by which everyone can discover a common humanity. A non-practicing lawyer, Mac Donald has clerked for the late Honorable Stephen Reinhardt, U.S. Court of Appeals for the Ninth Circuit, has been an attorney-adviser in the Office of the General Counsel of the U.S. Environmental Protection Agency, and a volunteer with the Natural Resources Defense Council in New York City. Her writing has appeared in National Review, Wall Street Journal, Washington Post, New York Times, The New Republic, The New Criterion, and Public Interest, among others. Mac Donald received her B.A. in English from Yale University, graduating with a Mellon Fellowship to Cambridge University, where she earned her M.A. in English. Her J.D. is from Stanford University Law School.